There’s nothing quite like a nice, warm salt bath on these cooler days. Adding salt to a warm bath can help soothe sore muscles, soften the skin, and more. With cold weather comes dry skin and one of the best things you can do for dry skin is to give it minerals. There are so many different types of salts it’s hard to know which is best. Which has the highest mineral content? Which is best for sore muscles? Which is best for detoxing? 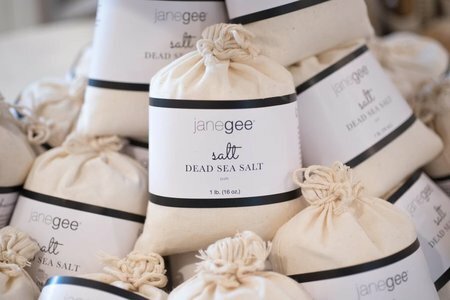 At janegee we have a natural salt bar where you can customize your own salt blends to get exactly what you and your body needs. There’s nothing better than a warm bath at the end of the day. Dead Sea Salt contains 10 times more minerals than ordinary sea salt. These minerals assist in cleansing, detoxifying and restoring a healthy body. 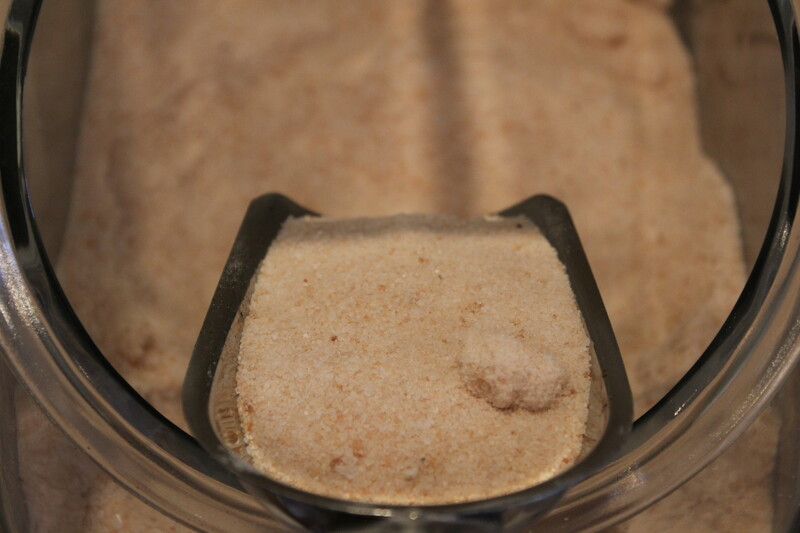 This salt will rid toxins from the skin and help in good blood circulation, eliminate dead skin cells and help in skin regeneration, relieve aches and body pains making the body more relaxed, assist in treating skin ailments such as eczema and psoriasis and reduced inflammation, helps relieve muscle tension, stress and anxiety. Can you see why it’s our favorite? 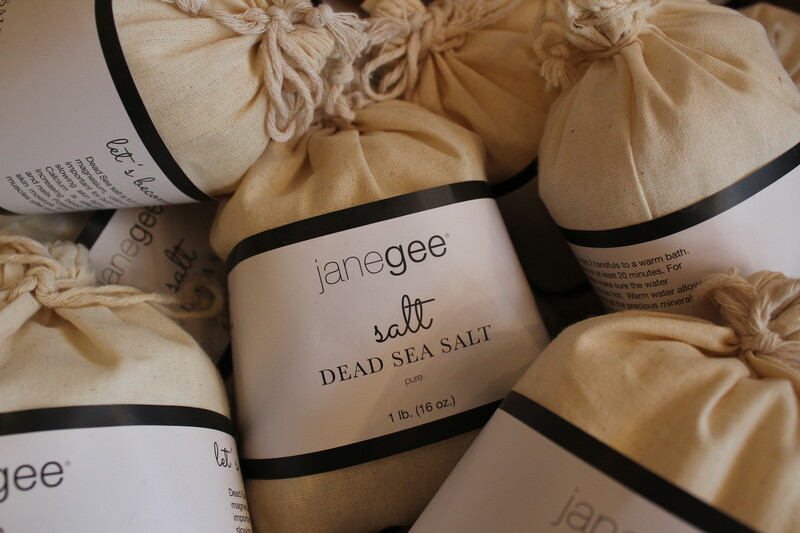 This salt is amazing, it’ll will make you never want to take a bath without Dead Sea Salt again. Make sure the bath water isn’t too hot when using it. Pure Magnesium Chloride is one of the best forms of magnesium, a mineral we’re often deficient in. Magnesium is used by nearly every cell and organ in your body. Put a scoop into the bath to provide relief for muscle aches and pains, to reduce stress, and to promote sleep. Magnesium is easily absorbed which makes this a great salt to bathe in and benefit your body inside and out. This is a great salt for sensitive skins, as Epsom salt can sometimes be irritating. Magnesium Sulfate, known as Epsom Salt, is great to help relax and soothe sore and aching muscles when added to a bath and is also great for detoxing. The sulfates in Epsom Salt helps to flush toxins, improve absorption of nutrients, helps form joint proteins, brain tissue and mucin protein, and helps prevent or ease migraine headaches. Sulfate is important for metabolic processes, the function of proteins and insulin. Deficiencies are linked with inflammation, muscle and skeletal disorders, and diabetes. You shouldn’t ingest Epsom Salts, so bathing is a good way to get the benefits for your body. Sourced from the deep underground salt mines in the Himalayas, these pink salts have over 84 minerals and trace elements – making them ideal to add to a bath for extra nourishment. Many of these elements found within each grain of salt naturally occurs within us and in the environment, so they are easily absorbed and utilized on a cellular level. Plus, it’s a beautiful salt, so who wouldn’t want to bathe in sparkling pink minerals?! 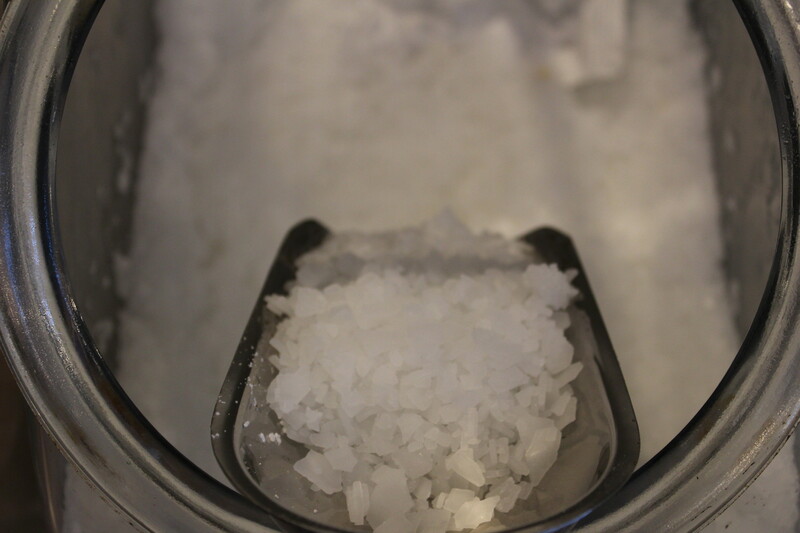 Come in and make your own salt blend to make every night feel like spa night. Whether you need a good detox, you want to soften dry skin, or you just need a nice way to relax, adding salt to a bath can provide amazing benefits. If you want to add essential oils, remember to dilute them into a carrier oil first. Since water and oil don’t mix, the pure essential oil droplets can adhere to your skin and cause irritation or burning. Add 6-8 drops of essential oils to a capful of oil or Epsom salts before adding to the bath to help the oils disperse throughout the water. Aromatherapy baths can be extra soothing, as long as you do it right. Try adding Rose Geranium essential oil to relieve depression and anxiety, and uplift your spirits to reduce stress. 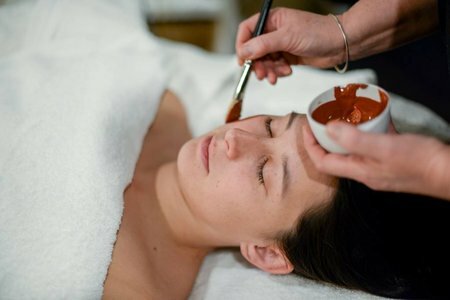 It also has anti-inflammatory properties as well as the ability to help promote healing for scars and wounds. Add Lavender essential oil to soothe aching muscles, relieve stress, and promote relaxation. Use Eucalyptus essential oil to melt away sinus congestion as well as headaches. Eucalyptus helps to decongest the airways and the sinuses. This is a very strong essential oil so be careful when using it, and avoid contact with your eyes. Baths are typically seen as a luxury, but they’re actually very beneficial for our overall health. If you struggle sleeping, taking a 20 minute bath at the end of the day can help. Even if you can only spare once a week. Take this time to be with yourself, meditate, read a book, or listen to music. Who doesn’t like an excuse to take more baths? !